September is a fantastic time to visit Venice, as Venetians return from their summer travels to see their city come alive with autumn events. From the cinematic spotlight of the annual Venice Film Festival to the buzz surrounding the Regata Storica di Venezia, Venice's biggest boat racing event of the year, and the celebration of the arts at La Biennale, there is no shortage of fun and interesting events and festivals in the Canal City in early autumn. Arena di Campo San Polo. Though this contemporary film festival begins in July, you can still catch one of the Italian-dubbed modern films (sometimes with English subtitles) into early September, before the start of the more famous Venetian film festival. Venice International Film Festival. The Venice Film Festival (Mostra Internazionale d’Arte Cinematografica) is an annual world famous film festival which brings in a bevy of Hollywood and international celebrities to grace the gondolas and red carpets of the Canal City. Held over a period of 11 days, the culmination is a prize awarded to the winning film, called the Leon d'Oro (The Golden Lion). Past Leon d'Oro recipients have included Akira Kurosawa, Gillo Pontecorvo, Robert Altman, Ang Lee, and Sofia Coppola. Venice International Short Film Festival. Held simultaneous with Venice's feature film festival, this short-film showcase during the first week of September includes screenings of lesser-known shorts, plus film competitions, and panels with the directors, producers, and cast members. Regata Storica di Venezia. 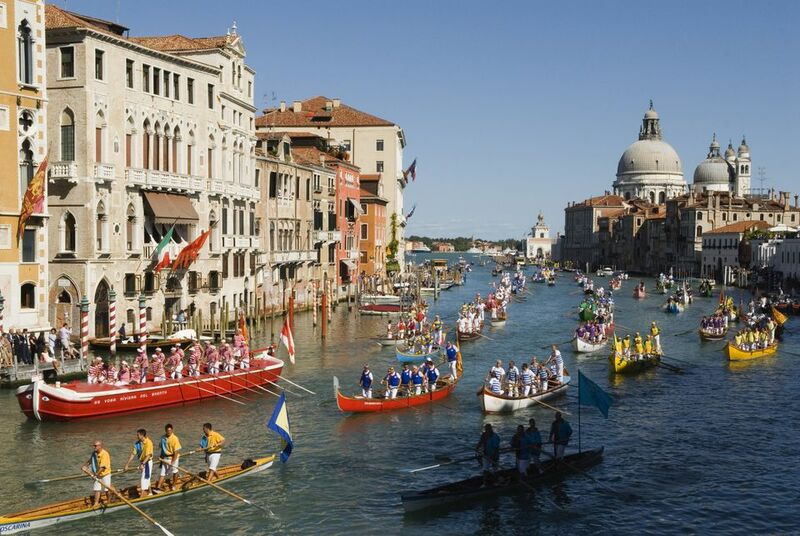 The Regata Storica (Historical Regatta), Venice's most exciting gondola race, sees teams of gondoliers (some decked out in costume) racing a course along the Grand Canal. Accompanied by food, music, and lively fanfare, the Regata Storica is a fun event to catch if you're visiting Venice in early September. For more updated information about the races, visit the Regata Storica di Venezia website. La Biennale d’Arte Contemporanea & Architettura. The months-long contemporary art extravaganza that is the Venice Biennale begins in June every other year during odd-numbered years and runs through November. In even-numbered years, the Biennale focuses on architecture. Festival of the Triumph of the Cross. This holy day is marked with a procession at the church and the Grand School (Scuola Grande) of San Giovanni Evangelista in the Sestiere di San Polo. Even if you are not religious, it is worth stopping by to see the impressive procession. Regata di Burano. Similar to Venice's Regata Storica, this thrilling race takes place on the island of Burano, near Venice, during the third weekend of September. Sagra del Pesce. This fishy feast is held at the same time as the Regata di Burano, and is, of course, located on the island of Burano. You will find lots of fried fish paired with white wine being consumed between Burano’s famous brightly colored houses. You may also be able to spot some rowers celebrating success after the race.